Brock Vergakis at the Virginian-Pilot offers a piece on the Lin espionage case. A Taiwanese-born sailor charged with espionage admitted to the crime after he was arrested at Honolulu’s airport and was interrogated by Naval Criminal Investigative Service agents, but his attorney says the statement shouldn’t be admissible at a trial, according to evidence presented at a preliminary hearing at Norfolk Naval Station last month. Lt. Cmdr. Edward C. Lin is a naval flight officer who faces two counts of espionage, three counts of attempted espionage and five counts of communicating defense information. Espionage is one of the most serious crimes in the Uniform Code of Military Justice, punishable under certain circumstances by death. The Navy played audio from Lin’s hearing for media outlets in Norfolk and at the Pentagon on Thursday. No witnesses testified, but prosecutors and defense attorneys submitted documentary evidence. Lin declined to make a statement at the hearing. It’s unclear when a decision will be made on whether to try Lin. U.S. Fleet Forces Command commander Adm. Phil Davidson doesn’t have a deadline for that decision. Cmdr. Johnathan Stephens, a military prosecutor, said agents interrogated Lin for about 11 hours over two days. Stephens said video from the questioning shows Lin admitting to committing espionage, making false official statements and committing adultery. 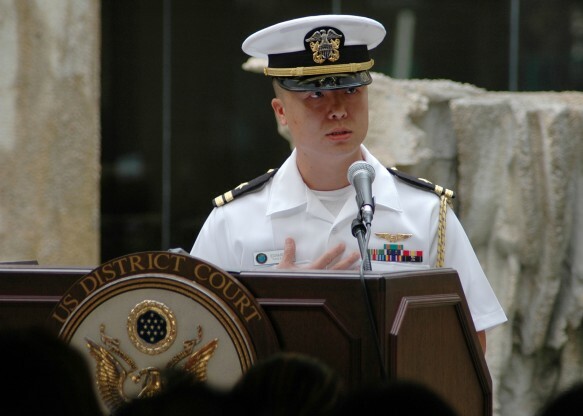 The Navy has not publicly said what classified information it accuses Lin of providing or to which government, although Lin’s attorneys have said it is Taiwan. Note: The above photo of Lin was released by the U.S. Navy.